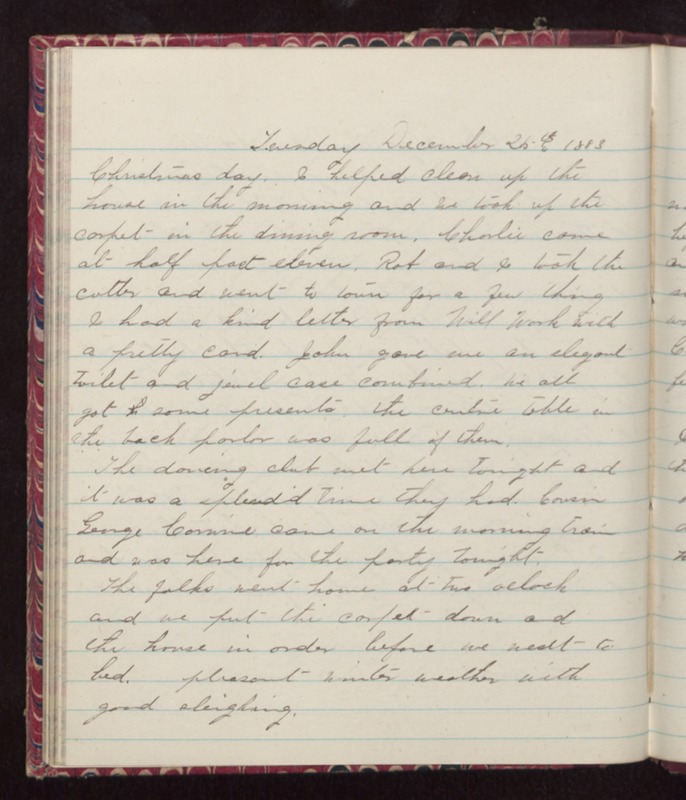 Tuesday December 25th 1883 Christmas day. I helped clean up the house in the morning and we took up the carpet in the dining room. Charlie came at half past eleven. Rob and I took the cutter and went to town for a few things. I had a kind letter from Will Work with a pretty card. John gave me an elegant toilet and jewel case combined. We all got some presents the centre table in the back parlor was full of them. The dancing club met here tonight and it was a splendid time they had. Cousin George Corwine came on the morning train and was here for the party tonight. The folks went home at two oclock and we put the carpet down and the house in order before we went to bed. pleasant winter weather with good sleighing.